I've made these before for cookie exchanges and thought they would make a great treat to box up for family and friends. 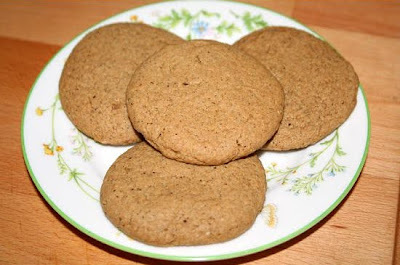 This is a soft, chewy cookie and the smell of them baking is intoxicating! They're great on their own or with a nice warm cup of tea. Mix flours, baking soda, salt and spices together and set aside. Cream together earth balance, oil and brown sugar. Add in milk, vanilla and cornstarch. Mix until light and creamy. Add dry ingredients to wet a little at a time until just blended. Roll cookies into balls and flatten out on an oiled or parchment paper lined cookie sheet. Bake about 6 minutes or until just golden brown. 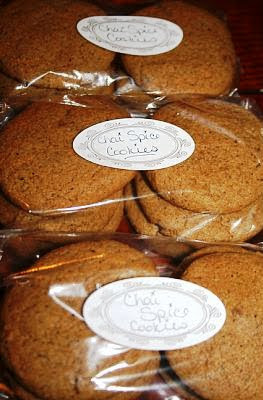 I've never had a chai cookie but I like the tea. These look great! Thanks Molly! If you like the tea, you will love the cookie!